If you or someone you know wears contact lenses, check out this freebie! 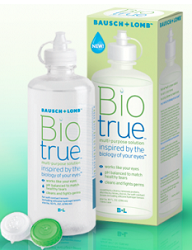 To get the FREE Bausch + Lomb Biotrue Multi-Purpose Contact Lens Solution Sample you have to select opti free pure moist and that will bring up the free sample form. You will receive a pretty nice sample! Click HERE.